The CASCADE CHORALE, a community chorus, is part of the music department at Central Oregon Community College. We currently have members who’ve sung with the chorus for decades, as well as members that have just recently graduated from high school. 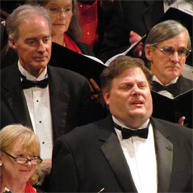 The Cascade Chorale has been under the direction of James Knox since 2004, and has approximately 75 talented singers. The Cascade Chorale Association (“CCA”) is a 501(c)3 organization which provides financial and organizational support to Cascade Chorale. CCA is a proud member of Central Oregon’s Arts & Culture Alliance. CCA’s mission is to make choral music accessible to everyone in the Central Oregon community. Our concerts are an enormous logistical and financial undertaking but, despite the cost of hiring support musicians, renting venues, and community projects, in 2012 we stopped charging admission to our concert-goers. We now rely solely on donations to fund most of our operations. Your tax deductible donation or sponsorship will help us to continue to bring beautiful choral music to Central Oregon. Please consider giving us your support today. For more information on Sponsorship opportunities and other ways to support the Cascade Chorale, please contact CCA President Debbie Cole. The Cascade Chorale Association appreciates your attendance and financial support. To make a donation, please click on the Give the Gift of Song button to the left. Thank you for supporting Central Oregon’s musicians!